The work of the abstract expressionist painter Jackson Pollock stands out as some of the most unique art America has yet seen. Art critics hail Pollock’s artwork as revolutionary, creative, and unique, giving it the highest praise, and valuing Pollock’s paintings in the multi-millions today. And yet to the layman, Pollock’s paintings may appear to be the random product of a depressed and disturbed alcoholic without any real talent. Only after taking a closer look at the technique, background, and styles of Jackson Pollock, can one begin to comprehend the sheer distinctiveness of Pollock’s work that makes it so impressive. Paul Jackson Pollock, who later went by Jackson, was born in Cody, Wyoming in 1912, and brought up in Arizona and California (Landau 12). Although he later preferred New York, he still carried a “definite feeling for the West,” which was reflected some of his art (Landau 13). Pollock was known to be pathologically introverted, with a low tolerance for frustration (Landau 12). He was “a rebel by nature,” and neither tradition nor authority held any allure for him (Karmel 92). His emotions spanned a wide range, from violent, fierce, and explosive, to romantic, sensitive, and undisciplined (Landau 11-12). Pollock often appeared to be a sweet and shy boy, but he also showed some aggressive and challenging behavior, usually depending in part on how much and if he had been drinking, a habit he developed at a young age (Landau 25). Finding school tedious, Pollock rarely participated much in class, except in art, and he took part in protests against school sports and the ROTC (Landau 24), leading to his expulsion from high school, after which he took on manual labor jobs alongside his father in 1929 (Cernuschi 12). As the youngest child, Jackson watched his brothers nurture a passion for the arts, and he followed their lead (Cernuschi 11). Without finishing high school, Pollock moved to New York to attend the Art Students League in the fall of 1930, where he studied under Thomas Hart Benton, one of the most renowned and controversial artists of the thirties (Landau 24). Benton was also a heavy drinker with a brusque and aggressive front. Taking to Pollock right away, Benton became somewhat of a surrogate father to Jackson, whose own father had little to do with him (Landau 25). The thirties were a difficult time for Pollock, as he faced hospitalization for alcoholism, the rejection of his marriage proposal, and the departure of some of his closest friends from New York (White 17). When Benton left New York in 1933, Pollock stopped taking classes, but continued practicing various art techniques (Landau 29). In the late thirties and early forties, Pollock began studying various artists and art forms, drawing from the techniques of artists such as Picasso and Miró, as well as the Indian sand painters of the West (White 19). In 1945, Pollock married the fellow abstractionist painter Lee Krasner, and the couple moved to the countryside in East Hampton, where he set up his studio in a nearby barn (White 23). With the help of a physician, Pollock remained sober almost entirely from 1948 to 1950, a period when he produced what is considered some of his finest work, his “poured paintings” (Cernuschi 157). By 1950, Pollock was at the pinnacle of his career, with the fear of “repeating himself” (Cernuschi 158). At the end of that year, Pollock returned, violently, to the bottle, at a time that coincided with a stylistic shift in his art, when he began producing his “black pourings,” which consisted of dark paint splattered onto light-colored canvases (Cernuschi 157). In the last three years of his life, Pollock hardly worked at all, finishing only five paintings between 1954 and 1956. This was a time when Pollock faced a difficult personal life, depressed, frustrated and miserable. Despite his notoriety, he was never financially stable, and as he faced marital difficulties, he began an affair (Cernuschi 199). On August 11, 1956, Pollock’s car crashed, bringing about a tragically premature death for the painter (White 81). Pollock showed little talent to set him apart from others until 1947, when he developed a radical new style, his pour technique (Varnedoe and Karmel 101). To create these “poured paintings,” Pollock worked with an unstretched canvas spread across the floor or against a wall, rather than painting on the traditional easel (Karmel 17). Instead of a paintbrush, Pollock worked with sticks, trowels, and knives, dripping and flinging diluted commercial paint across the canvas (Karmel 18). Pollock’s poured paintings reflected the concept of allover composition, treating every square inch of canvas with equal prominence, so that there would be no center of attention or subject in the painting (Cernuschi 271). This idea is central to most of Pollock’s best-known artworks. The style and technique of creating these paintings must have felt liberating. Without a particular figure to put on the canvas, Pollock was free to let the picture take form without any restrictions, allowing spontaneity and physical freedom in the painting process. As a result, the significance of Pollock’s art comes more from the action or the progression of painting, rather than the contemplation over the work, or even the final product (White 25). And yet Pollock’s art was certainly not the result of thoughtless paint splattering. He would often pause his painting for hours, considering the blank canvas or the work in progress. His wife Lee Krasner commented that “his control was amazing” (Cernuschi 128). Pollock emphasized this point when he said, “The painting has a life of its own. I try to let it come though. It is only when I lose contact with the painting that the result is a mess. Otherwise there is pure harmony, an easy give and take, and the painting comes out well” (Karmel 18). In 1949, Life magazine published an article featuring the title “Jackson Pollock: Is He the Greatest Living Painter in the United States?” (Karmel 63). This title was chosen more to mock positive critiques for Pollock from supporters such as Clement Greenberg, than to give the artist praise. Even the article’s description of Pollock’s distinctive new painting style is humorous to the point that it ridicules the painter, leaving the reader with the thought that this is an artist who did not deserve his newfound prominence in American museums. Yet the sheer presence of this article in a magazine such as this shows Pollock’s arising notoriety among general society, whether or not comments about the artist were flattering. This claim is not well founded. Pollock’s artworks are most often considered complex, and many critics maintain that a deeper look into Pollock’s background can reveal the true genius behind the artwork. Yet Alfieri combats that argument with the declaration, “Damn it, if I must judge a painting by the artist, it is no longer a painting that I am interested in, I no longer care about the formal values contained in it” (Karmel 69). Again, this is an ill-founded case because most artworks become more meaningful once the viewer becomes familiar with the artist and the background behind the creation of the piece. Another critic, Robert M. Coates claimed that in Pollock’s works “the basic values of a composition are lost in a clutter of more or less meaningless embellishment,” while Allan Kaprow stated that “This type of form allows us just as well an equally strong pleasure in participating in a delirium, a deadening of the reasoning faculties, a loss of ‘self’ in the Western sense of the term” (Karmel 87). Yet others may claim just as convincingly that Pollock’s paintings are invigorating and thought-provoking because they stimulate curiosity about the artist and the technique. Despite Alfieri’s and others’ outspoken comments challenging the quality of Pollock’s paintings, praise increasingly became the more common response. In 1945, Clement Greenberg, the greatest critic to champion Pollock, called the artist “the strongest painter of his generation and perhaps the greatest one to appear since Miró” (Karmel 52). When the public balked at Pollock’s paintings, seeing them as unappealing aesthetically, Greenberg asserted that “In Pollock there is absolutely none [self deception], and he is not afraid to look ugly—all profoundly original art looks ugly at first” (Karmel 53). Similar to this claim, Leo Steinberg argued in 1955, “The Pollock looks as every Van Gogh looked fifty years ago—something that you and I could do as well. But this is surely what the artist means. He has no love for conspicuous diligence; and if it comes to that, have we?” (Karmel 83). This is an interesting point to make because it helps the everyday person question what he truly appreciates in a work of art. It is such an idealistic American idea that an average person could see a painting and imagine that it was created more by a peer than by a superior, and be able to better relate to the art. Pollock’s poured technique “was considered so radical that its very invention broadened the possibilities of painting” (Cernuschi 266). His greatest achievement is arguably the fact that he created his own technique that was so unique that it shocked some, delighted others, and fascinated still others. Pollock’s style was so much his own that future artists could not legitimately imitate his technique. Irving Sandler claimed that his method was so distinctive that it could not “be followed without yielding counterfeit Pollocks” (Cernuschi 266). Clement Greenberg also praised Pollock for avoiding “the corrupting influence of popular taste” (Cernuschi 269). It seems that this timelessness of Pollock’s art is to be admired, but it is also contradictory to the claims of some art theorists, such as John Dewey, who argues that art “expresses the life of a community” (Freeland 78). There is little reflection of the United States that can be taken from Pollock’s poured paintings, but they do express the artist’s own feelings and emotions. More than expressing the life of America, Pollock changed it, which is arguably a more notable impact. Because Pollock’s art was so radical, he forced art critics to look at art in a new way, as he delved into the subconscious. Pollock was never shaken by negative reactions to his art, and he never tried to cater to the demands of popular culture. In response to Alfieri’s Time Magazine article entitled “Chaos, Damn It!” Pollock began his reply with “Sir: No chaos, damn it” (Karmel 71). This resolute determination to avoid the influence of critics is admirable and increases the artistic quality of his paintings. In 1974 there were claims that “Blue Poles: Number 11, 1952” came into being on a night when Pollock had been drinking heavily with the sculptor Tony Smith. In response to these statements, the Daily Mirror’s headline exclaimed “Drunks did it!” Defending Pollock, Australian Senator Murphy responded “I suppose the painting may best be judged by what it is rather than how it came about.” The idea that artistic value could be disconnected from traditional cultural values of sobriety and responsibility was completely revolutionary (White 9). During Pollock’s lifetime, he never made much money from his painting, but in more recent years, Pollocks have been selling for millions. In 2006, one of Pollock’s painting’s “No. 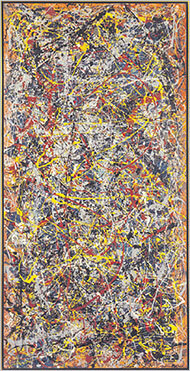 5, 1948” sold for 140 million dollars, setting a new record for the most money ever paid for a painting (Usborne). Recently a debate has been brought up over the painting of Teri Horton, an eight-dollar thrift store purchase, questioning whether or not it is a legitimate Jackson Pollock painting, and therefore worth millions (Biro). In 2007, Tom Hanley, a finger print examiner with nearly thirty years of experience, further investigated the claim of Peter Paul Biro that the same fingerprint was on the back of Teri Horton’s painting and on a paint can from the Pollock-Krasner House. Hanley found that there was not enough detail to determine conclusively that the same person deposited both prints (Fine Art Registry). The intense debate over the authenticity Horton’s painting shows how much the artist matters with respect to the artistic value of a work of art. When the painting stood on its own without Pollock’s name attached to it, it was worth only eight dollars, but if it can be proved that Pollock was truly the painter that created Horton’s picture, it suddenly becomes a priceless treasure. This shows that the value of a painting is assessed primarily by the background behind the painting rather than by the aesthetic quality. Pollock’s style was revolutionary; his paintings are unique and radical, so any effort to imitate his art will not carry the same legitimacy of Pollock’s work. Although Pollock’s personal life could often be unstable, his paintings reflect a deep confidence. Pollock seemed to paint for no one but himself, a thought that he articulated when he claimed, “Painting is self discovery. Every good artist paints what he is” (Varnedoe and Karmel 151). In his paintings, Pollock expressed his own emotions and painted exactly the way he wished, ignoring the influences of popular culture, critics, or negative comments. Pollock was willing to take risks in his art, disrespecting the boundaries of technical experimentation, as he forged his own unique style (Varnedoe and Karmel 117). Pollock’s paintings are intricate, deeply complex, and fascinating. Many of them are beautiful. The sheer size of them can be breathtaking. But what makes Pollock’s work so significant is that he created a set of paintings that cannot be duplicated or imitated. They were revolutionary at the time Pollock made them, but they are still just as radical and unique today. Jackson Pollock put much effort and consideration into his paintings, so that every stream of paint was laid on the canvas with purpose, a reasoning that perhaps only he understood. This is what makes Pollock’s paintings so priceless today. Cernuschi, Claude. Jackson Pollock: Meaning and Significance. New York: HarperCollins Publishers, 1992. Freeland, Cynthia. But Is It Art? An Introduction to Art Theory. Oxford: University Press, 2001. Karmel, Pepe. Jackson Pollock: Interviews, Articles, and Reviews. New York: The Museum of Modern Art, distributed by Harry N. Abrams, Inc., 1999. Landau, Ellen G. Jackson Pollock. New York: Harry N. Abrams, Inc., 1989. Varnedoe, Kirk and Pepe Karmel, eds. Jackson Pollock: New Approaches. New York: The Museum of Modern Art, distributed by Harry N. Abrams, Inc., 1999. White, Anthony, ed. Jackson Pollock’s Blue Poles. Sydney: National Gallery of Australia, 2002. To many people, the works of the abstract expressionist painter Jackson Pollock appears to be the random paint splattering of a drunk without any real talent. Yet the artworld values the worth of Pollock’s paintings in the multi-millions, claiming that it reveals creativity and sheer distinctiveness that cannot be reproduced or imitated. This is what makes Jackson Pollock such a talented and remarkable artist.